The Biblical Prophesy About The Simon Necronomicon? I would like to take the time now to show some of the Mysteries of the Necronomicon (Qliphotic) Tradition If this is your first time here, you may want to check some of our earlier posts to gain a deeper appreciation for our current discussion. Enjoy and stay blessed. Or course, among scholars and the like, the Necronomicon Tradition would logically have some things in common with Christian concepts before its gentrification. We can even see how Christianity was gentrified based on the appearance of the Biblical characters possessing, for the most part European features, while the region of where the teachings began was populated predominantly by people of African, Arab, and Semitic descent. It would also seem appropriate to conclude that during this gentrification process, many of the core teachings were altered as well to try to separate it from its esoteric pagan foundation. “1: And I saw in the right hand of him that sat on the throne a book written within and on the backside, sealed with seven seals. 2: And I saw a strong angel proclaiming with a loud voice, Who is worthy to open the book, and to loose the seals thereof? 3: And no man in heaven, nor in earth, neither under the earth, was able to open the book, neither to look thereon. 4: And I wept much, because no man was found worthy to open and to read the book, neither to look thereon. 5: And one of the elders saith unto me, Weep not: behold, the Lion of the tribe of Judah, the Root of David, hath prevailed to open the book, and to loose the seven seals thereof. 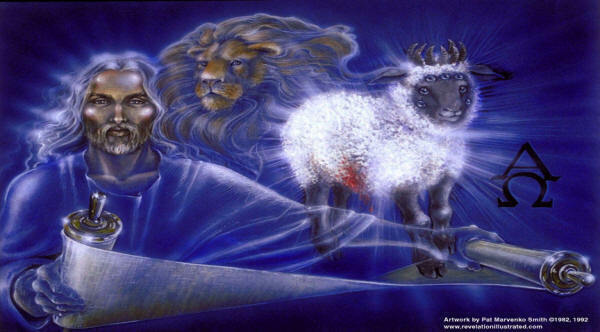 6: And I beheld, and, lo, in the midst of the throne and of the four beasts, and in the midst of the elders, stood a Lamb as it had been slain, having seven horns and seven eyes, which are the seven Spirits of God sent forth into all the earth. 7: And he came and took the book out of the right hand of him that sat upon the throne. 8: And when he had taken the book, the four beasts and four and twenty elders fell down before the Lamb, having every one of them harps, and golden vials full of odours, which are the prayers of saints. 9: And they sung a new song, saying, Thou art worthy to take the book, and to open the seals thereof: for thou wast slain, and hast redeemed us to God by thy blood out of every kindred, and tongue, and people, and nation; 10: And hast made us unto our God kings and priests: and we shall reign on the earth. “4: And I wept much, because no man was found worthy to open and to read the book, neither to look thereon. 5: And one of the elders saith unto me, Weep not: behold, the Lion of the tribe of Judah, the Root of David, hath prevailed to open the book, and to loose the seven seals thereof. Although people try to disregard the Simon Necronomicon as being a hoax, we have to credit it as the only system to date, which Initiates the candidate into forms of ancient divination that was practiced by the faithful Chaldeans. According to verse 10 in the chapter of Revelation cited above, we find that the Initiate of the Necronomicon Tradition is a product of the esoteric Sacred Marriage Rite and is made a Kingly-Priest/Priestess.